Back during the summer of 1928 if you were walking across the old iron truss bridge spanning the Farmington River, you may have been startled to see George Lang in his Model A Ford or Ed Sackett in his 1923 Velie towing a 40 gallon industrial soda-acid chemical tank to the scene of a fire. 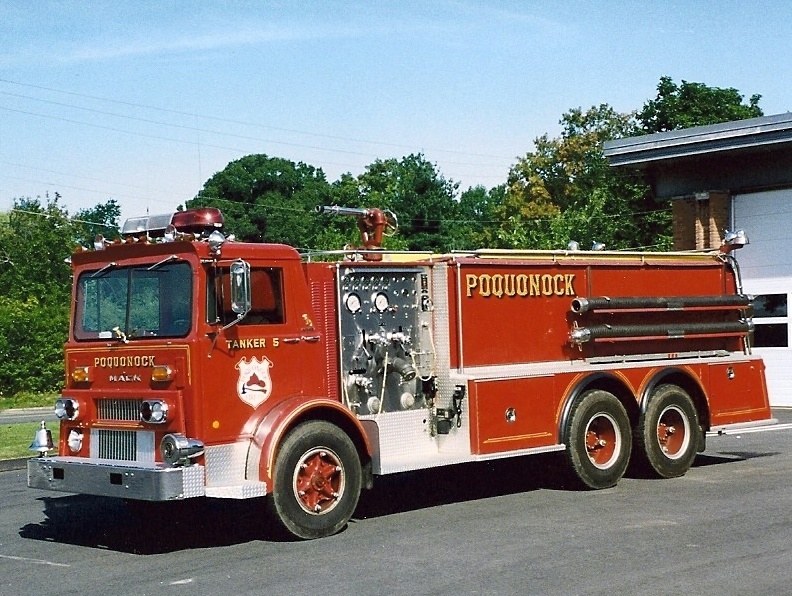 It had been over 30 years since the village of Poquonock had an active fire fighting force. This earlier fire company had a hand pumper and hose cart that was housed in a building which formerly stood on the east side of Poquonock Avenue across from the present firehouse. The building was moved to the rear of 1691 Poquonock Avenue immediately north of the present fire house. It is still standing today. 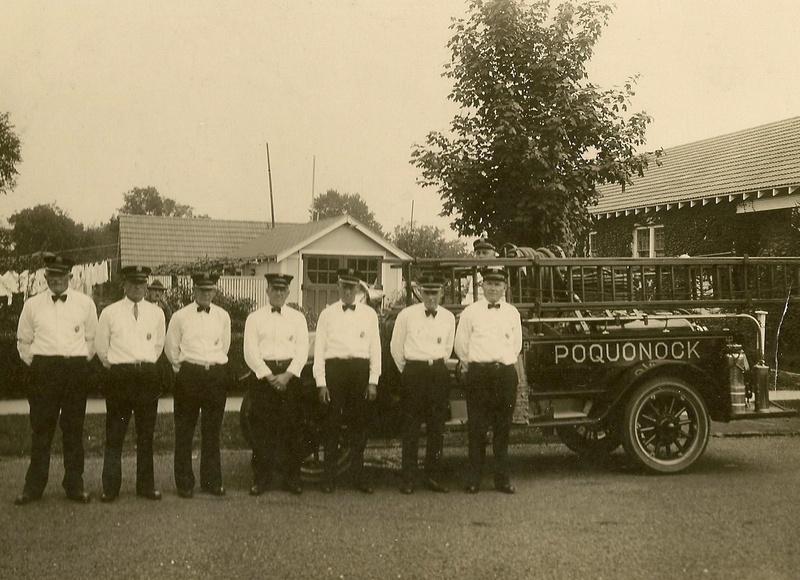 During these years without an organized fire company, the village of Poquonock relied on the rapid blast of the steam whistle at the Dunham Mill to signal the alarm, and all available men were called on to man a bucket brigade from the closest water supply. If the fire was close to the mills, hose lines could be stretched from the mill using the mill's hose carts. There were two mills operating and using all of the hose in the village, a line could be stretched almost to the intersection of Rainbow Road. The Windsor (Center Fire District) was also called on for assistance. Markers were erected at water sources to assist Windsor in promptly locating ponds and brooks. Early in 1929 a small group of local business men, including George A. Lang, who ran an auto repair business on Tunxis Street, Edward W. Sackett, who owned a grocery store at what is now 45 Tunxis Street (then at the corner of Poquonock Avenue and Tunxis Street), and Edward J. Kernan, who operated an insurance and real estate business, called an open meeting at the Poquonock Town Hall for anyone interested in helping to organize and support a new fire company. The response was excellent. A committee of Stanton F. Brown, Arthur Hagarty and Charles A. Huntington, Jr., was named in April to proceed with the organization. As a Result of these meetings, the first Constitution and By-laws were adopted on May 20, 1929, and the granting of a Charter by the State Legislature followed on May 29, 1020. 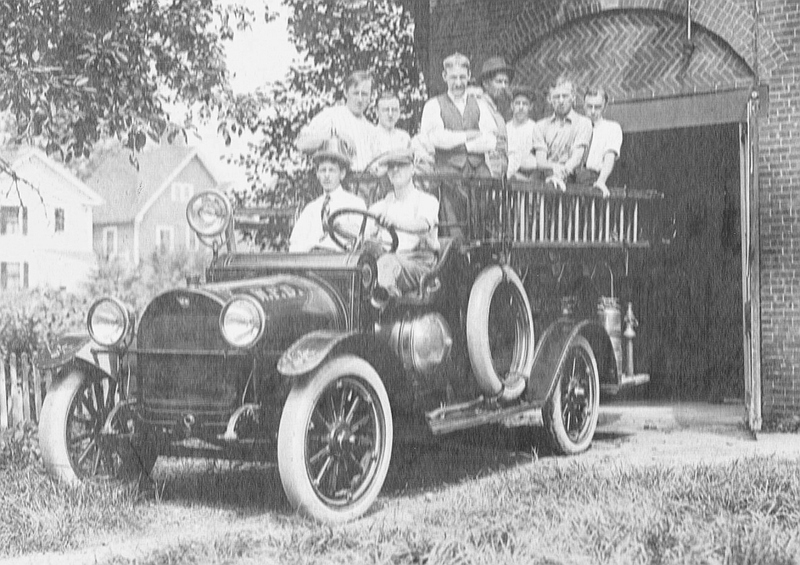 Coincidentally, a new American LaFrance 500 gallon per minute pumper had been delivered to the Windsor (Center) Fire Department the 1st of February, 1929. That department generously donated their 1918 Reo Speed-Wagon Chemical Truck to the new company. One of the first orders of business in writing the Constitution was to decide on the name of the new fire company. Despite the location of the new company in the village of Poquonock, the members from the Rainbow section of town had strong feelings about Rainbow being represented in the name. 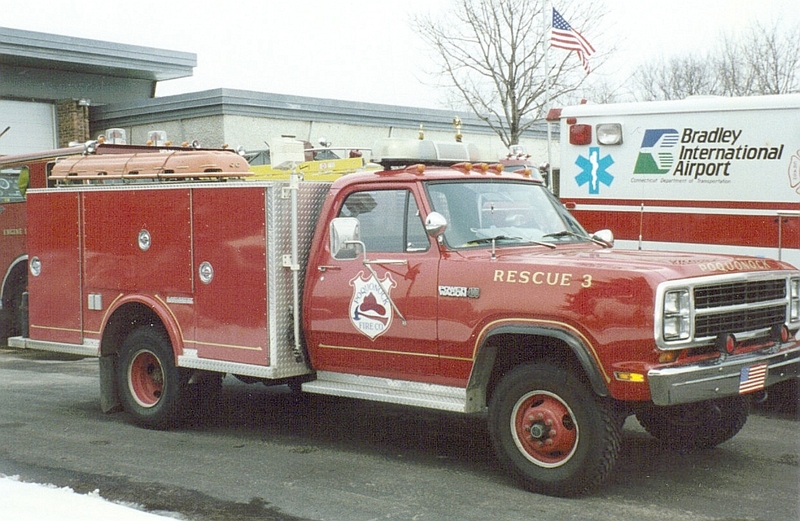 This problem was solved by adopting the name: North End Volunteer Fire Company. During the first few months George Lang, provided a garage for the Reo in his repair garage on the north side of Tunxis Street. During the first year arrangement were made to rent a garage from Ed Sackett on Tunxis Street. This building continued to be used as a fire house until the Company moved to the converted Town Hall in 1950. The first siren was placed atop the Sackett building next door to the firehouse. It was later moved to the top of a pole a short way up the hill on a lot owned by George Lang. The summer of 1929 was a very busy time for the new volunteers. Preparing the new truck for service, installing and testing new sirens, running a cash drive throughout the north end of town, as well as planning the first of several carnivals, took up much of their spare time. Fortunately they were not interrupted by too may fire calls. The first call was received until October 19, 1929. June 1935 - New 1935 Ford V-8 chassis purchased, body and chemical tanks from Reo Speed-wagon installed. Sept 1936 - Proceeds from carnival voted to go into pumper fund. Feb 1937 - An attempt was make to purchase a lot for a new firehouse just south of the old iron bridge. June 1938 - Executive Committee was authorized to investigate the installation of a water pump on the 1935 Ford. Sept 1938 - Chief George Lang reimbursed expenses of $34.55 for his trip to Buffalo for installation of the new Hale pump on the 1935 Ford. Feb 1940 - Spent $70.00 for blasting hole in the Farmington River behind barber shop on River Street for water supply when river was low. Sep 1940 Hole had to be dug out as filled with silt. Project abandoned after first year. Mar 1941 Constitution amended to automatically give active member entering the Armed Forces a leave of absence. Dec. 1943 Overhead door purchased for firehouse. June 1945 Purchased used air raid siren from West Hartford for $250. Mar. 1948 Supplied drivers for Windsor ambulance. July 1948 Spectacular multiple shed tobacco shed fire on Day Hill Road. July 1948 Voted to authorize Chief and Tanker Purchase Committee to purchase tank truck not to exceed $1600. Sep. 1948 Committee appointed to meet with Town Council for new fire house in Poquonock. Nov. 1949 Car markers voted for members. Jan. 1949 Requested funds for converting Old Town Hall to Firehouse. Feb. 1950 Work began on new firehouse in Old Town Hall. Sep. 1950 Moved into unfinished Firehouse. Dec. 1950 Major revision of Constitution and by-laws. Name changed to Poquonock Fire Company. Sept. 1950 Special meeting to discuss replacing Tank Truck Tractor after accident on Sept. 15. Five men riding truck, two with serious injuries. Accident occurred on Stone Road while responding to tobacco shed fire near East Granby town line. Over $6000 collected in cash donations. Sep. 1951 Order place for new F-8 Ford truck for tanker. July 1952 Two-way radio purchase discussed at meeting. Jan 1953 Two-way radios purchased with matching Civil Defense funds. March 1953 Radios installed in Engine and tanker. Jan. 1954 Pyroblender (wet water) installed on tanker. 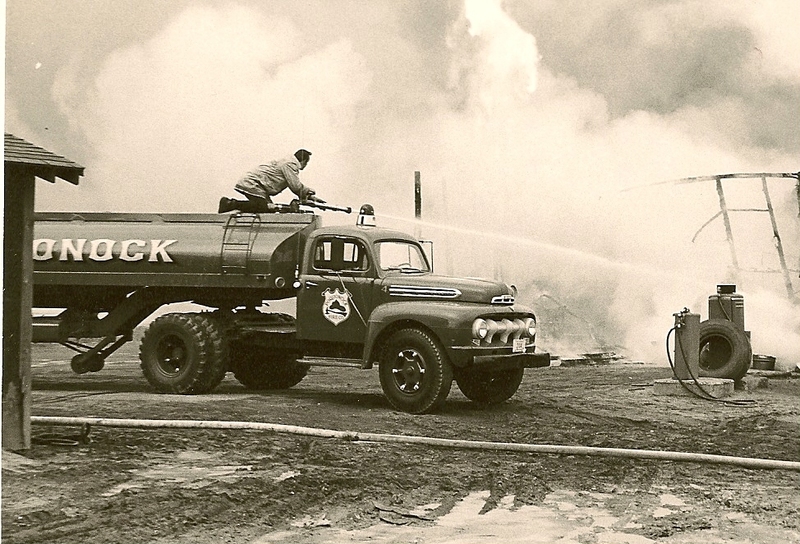 July 1954 Second tanker purchased, 3500 gallon Brockway. 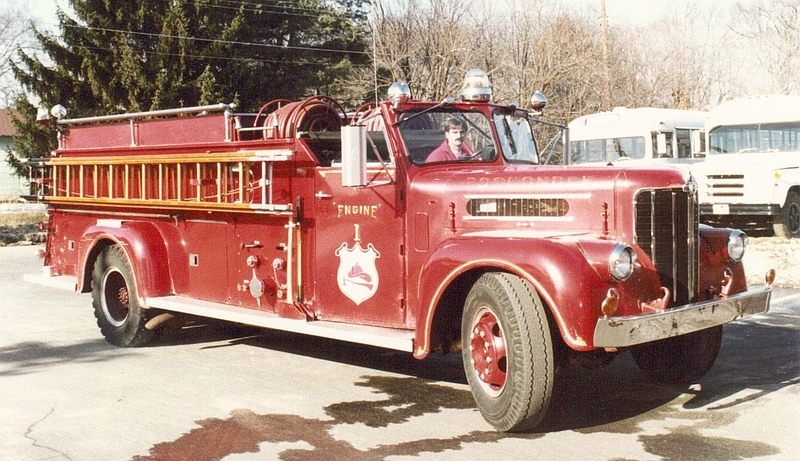 Aug. 1954 Committee appointed to request new pumper from Town. Aug. 1955 1955 Flood. Evacuated all residents near river for fear of Rainbow Dam failing. Dec. 1955 Voted to incorporate. 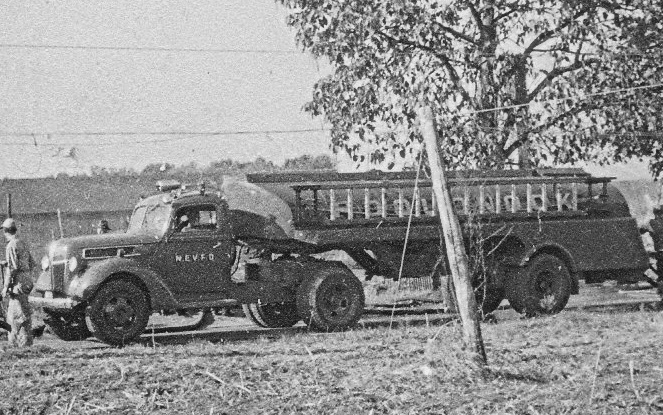 May 1956 New Maxim 750 GPM pumper delivered. Dec. 1956 Voted to stand fire watch at all village churches on New Years Eve after multiple suspicious church fires in other communities. Jan. 1957 Voted to investigate locating two additional sirens on Day Hill and Rainbow Road. Dec. 1957 George Lang resigned as Chief but continued on as active member. April 1958 Purchased new uniforms. Cost $27.50 for pants, shirt and hat. Members donated $10.00 of cost. June 1958 Raffle voted. Raised $1875.07. Oct. 1958 Insignia designed by Barbara Garner. May 1959 Metropolitan District water connected to Firehouse. Well abandoned. June 1959 New phone alarm notification system installed in homes of seven members. Dec. 1959 Purchased exhaust fan smoke ejector. Oct. 1961 Foam tank installed on Tanker. Mar. 1962 Sponsored "Festival of Harmony" cleared $1800. 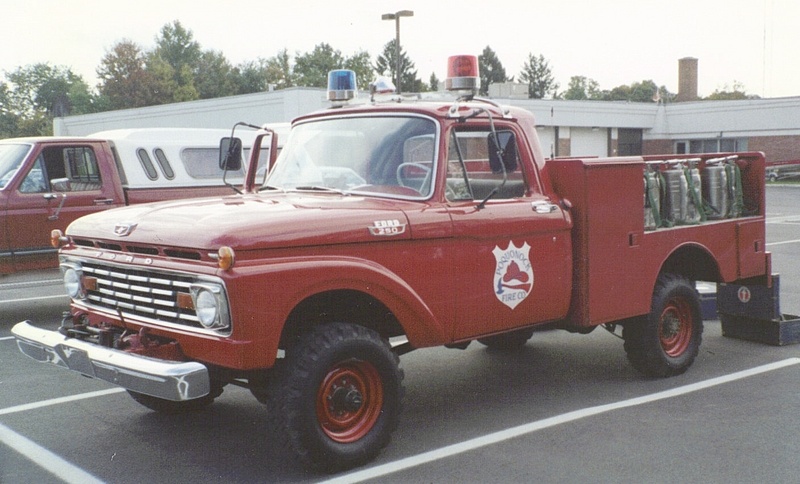 July 1962 Ford Emergency truck ordered. Oct. 1962 Fire in steeple of St. Joseph's Church. All equipment in town responded mutual-aid from Windsor Locks for aerial. Dec. 1962 Emergency truck delivered. June 1963 New home radio alerting installed in member's homes. Mar 1964 Turret gun for tanker purchased. July 1964 Discussion: Remodel firehouse or request new one. April 1965 Council Meeting to discuss new Firehouse. Aug. 1965 Voted to accept St. Cashmir's offer to use their Hall for meetings during construction. Jan. 1966 Moved into new firehouse. June. 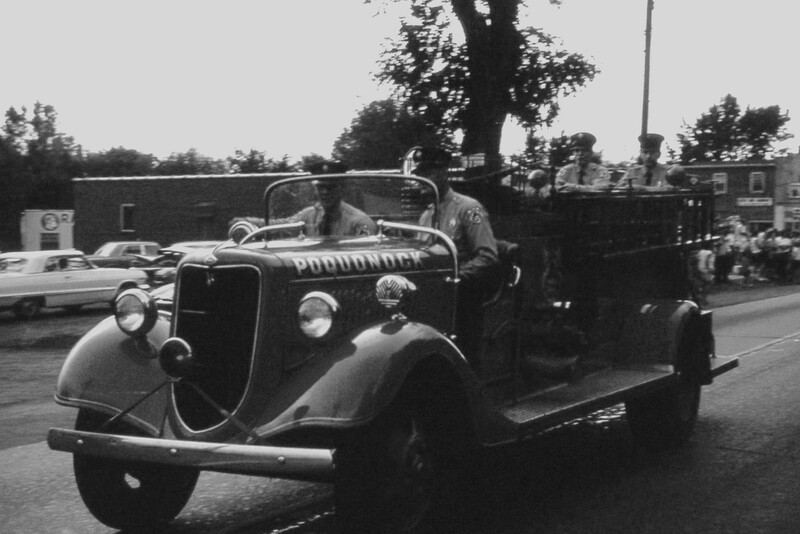 1966 Dedication ceremony for new fire house. Aug. 1967 Purchased new hose washer. Oct. 1968 Committee appointed to investigate purchase of new Tank Truck. June 1969 Voted to purchase 14 foot boat, motor, trailer and accessories for $700..
June 1969 Discussed procedures for responding to riot situations. July 1969 Purchased new uniforms. Double breasted jackets, pants, and white shirts. May 1970 Woman's Auxiliary formed. June 1971 New radio antenna tower installed. Oct. 1972 Mack diesel, 2000 gallon tanker with 750 GPM pump delivered. Mar. 1974 Voted to sell original tanker for $2000. Jan. 1975 Siren put in service at Landfill site. June 1975 Voted to sell 1935 Ford for $200. 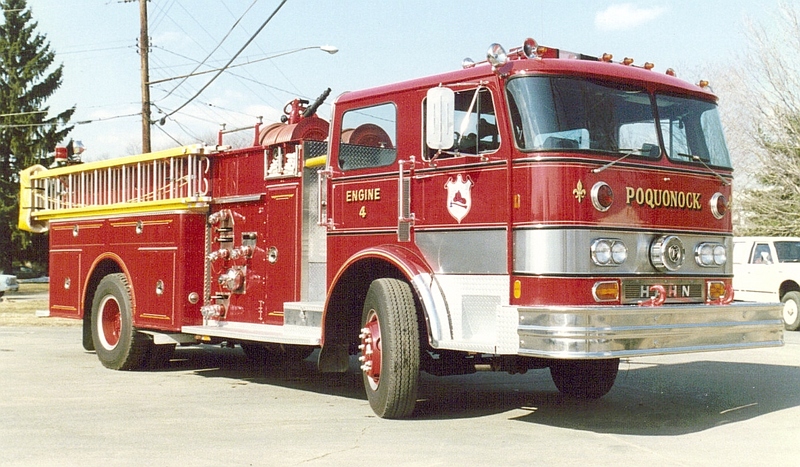 Jan. 1976 Hahn diesel, 1500 GPM delivered. Nov. 1976 Voted acceptance of Line Officer Tests used to evaluate candidates for future Line Officers. July 1977 Emergency Medial Service unit organized. Oct 1979 Tornado destroys numerous buildings, multiple rescues , medical responses. Stationed manned for a week as searches and clean-up activities continue.